Lana Del Rey performed an a cappella excerpt from her new single 'West Coast' at her first gig of 2014 last night (11 April). Watch it below. The show took place at The Chelsea, and was Del Rey's first since November of last year. 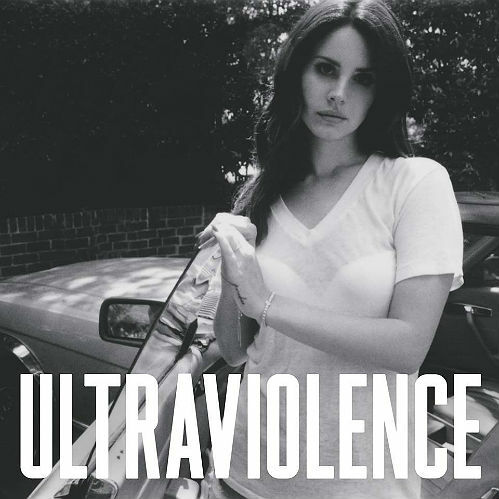 The singer took the opportunity to perform a few a cappella lines of 'West Coast', which was recently revealed as the first single to be released from new album Ultraviolence. During the gig, Del Rey had a long discussion with other members of the band, debating whether or not to perform the song for the screaming fans, where she could be heard saying, "Just up to the chorus? No? ", before conceding: "I'll just sing you a little bit of the verse without the band." Lyrics from the song, which will be officially premiered on BBC Radio 1 on Monday (14 April), include: "Down on the West Coast, they got a saying; 'If you're not drinking then you're not playing', but you put the music, you put the music in you." Del Rey is also set to perform at California's Coachella Festival on Sunday (13 April), and will perform at Glastonbury Festival in June. No release date has been confirmed for Ultraviolence, but 'West Coast' gets its first official play on Monday (14 April) on BBC Radio 1. 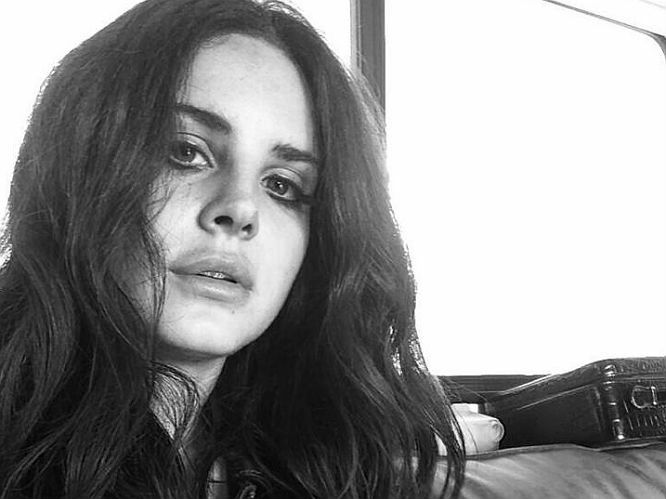 April 4 - 'West Coast' is confirmed as first Ultraviolence single: Probably not being able to bear the number of scratchy, terrible demos being hawked around the internet as Ultraviolence cuts, Lana finally confirmed the first official single from Ultraviolence will be called 'West Coast' to fans on Twitter, then Facebook. She also posted a moody black and white shot of herself. Lana's back. April 9 - A BILLBOARD APPEARS: Taking a leaf out of Beyonce's BILLBORT book, a massive poster screaming ULTRAVIOLENCE appears in New York. Subtle. There's also a picture of Lana being very Lana-ish and moodily smoking a cigarette. This campaign is officially GO. April 10 - ANOTHER BILLBOARD APPEARS: The very next day, a second billboard appears (this time in Los Angeles) but it's a little different. 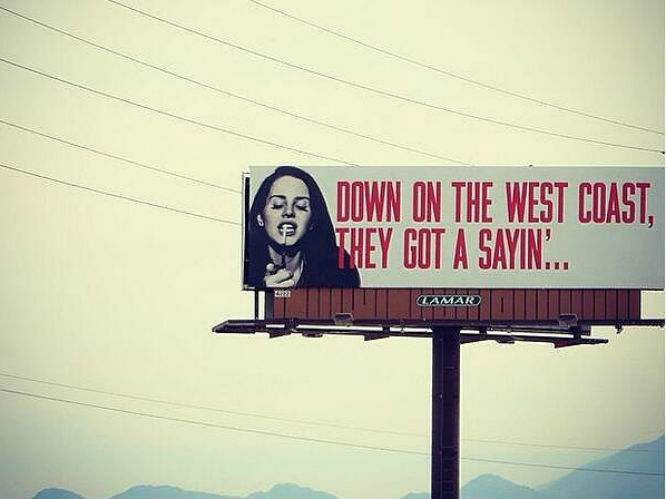 There are what seems to be lyrics on it ("Down on the West Coast, they got a sayin'") and the same picture of Lana puffing on a cigarette. Everyone bickers about whether it's real or Photoshopped for a while. Turns out it's real. April 11 - The artwork for 'West Coast' is revealed: Lana unveils the lovely cover to 'West Coast', where, inevitably, she looks beautiful and wistful, because she is beautiful and wistful - as a rule. April 11 - Lana plays her first live show of 2014 in Las Vegas, before heading to Coachella at the weekend to perform on the Sunday of the hip, kale-fuelled, smoothie-drenched festival. The question is, will she debut material from Ultraviolence?. To which yes, probably, is the answer. 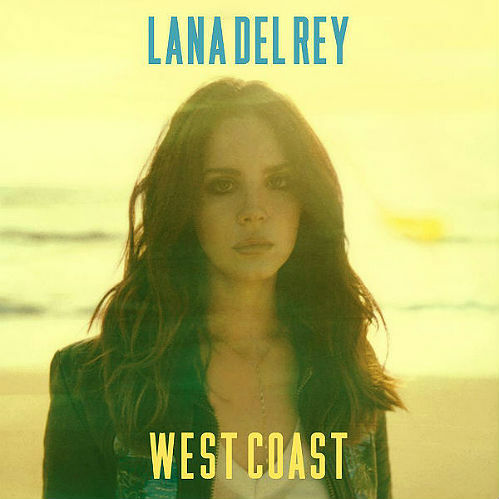 April 11 - 'West Coast' premiered on BBC Radio 1, on April 14. A sultry, slow burning slice of guitar-pop, it didn't disappoint us. May 7 - The 'West Coast' video is unveiled: Unsurprisingly, it's as moody and sultry as the track itself, featuring Lana interacting with two lovers - one a young man, one much older. May 9 - The track listing for Ultraviolence is revealed: Thankfully, it sounds amazing. Featuring titles such as 'Fucked My Way Up To the Top', 'Pretty When You Cry', and 'Money Power Glory', it's so Lana it hurts. 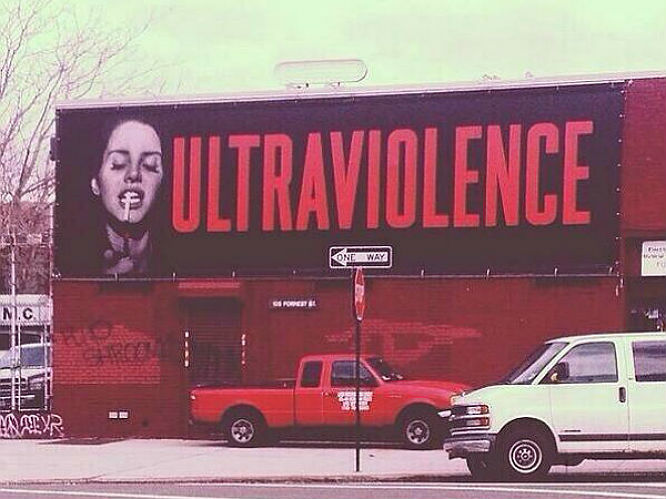 May 10 - The Ultraviolence artwork is unveiled: And it's surprisingly low-key. Dressed down in a simple white t shirt, it's a simple black and white (we're sensing a theme here) shot of the superstar posing next to a car. Four days later, the release date - June 16 - is revealed, as well as pictures of the collector's edition and deluxe set. 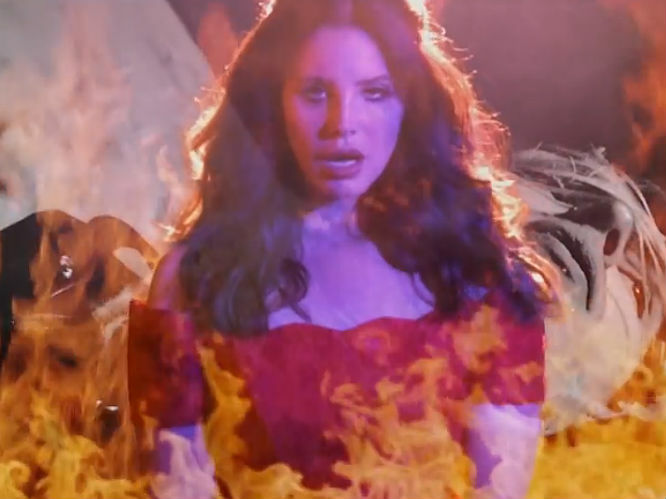 May 26 - Lana shares 'Shades of Cool': Instead of messing us around with fuzzy demos or 10 second clips, Lana shares the full, official audio for Ultraviolence track 'Shades of Cool'. A guitar-tinged, 70s inspired ballad, it's a winner. May 26 - Lana performs Ultraviolence's title track at a show: During a gig in Vancouver, Lana premieres 'Ultraviolence' - a stirring, epic pop-rock ballad, which also has Dan Auerbach's name written all over it. 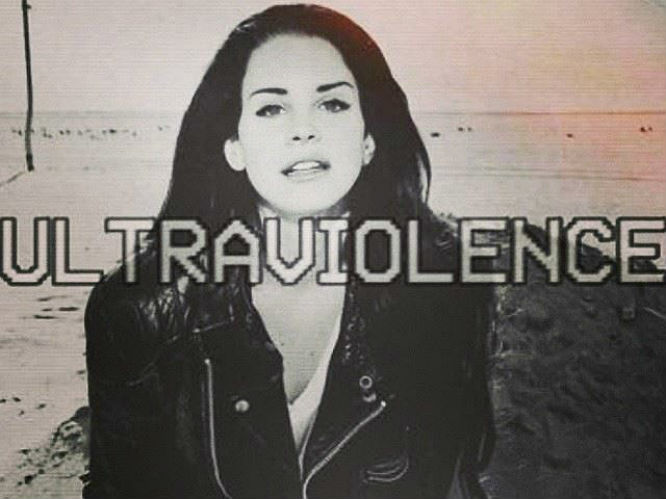 May 27 - The promo clip for Ultraviolence leaks: The 17 second clip features the official audio of the album's title track, as well as - guess what? - moody, black and white shots of Lana looking wistful.